From The Chicago Tribune, April 30, 1901. One hundred new mail boxes with automatic attachments, showing the time of the last and of the next collection of mall, were received at the post office yesterday, and will be installed in the down-town district within a week. They are known as the Montague box, and are a San Francisco invention, where they are in general and successful use. If they prove popular in Chicago Postmaster Coyne hopes to be able to remove all the old-style boxes and substitute the new ones. By a device attached to the front of the box the mall carrier, in opening and closing It, registers the time of the next collection. Above the usual card showing the collections for the day is a strip of glass beneath the words “Next Collection.” When the carrier removes the mail the figures and words showing the time of the next collection, and also the time the collection will be due at the post office, appear. The public will be able to tell at a glance when the mail will be taken up again, and by reference to the usual schedule card can also ascertain when the carrier last made his rounds. In the downtown district the attachment will register twenty-six times during the day. On Sunday, when only a few collections are made, the automatic attachment will not be in use, and the collections will be made according to the usual card. Chicago will be the first city outside of California to be equipped with the new boxes. A representative of the Post Office department passed through the city yesterday on his way to Buffalo to install ten of the boxes at the Pan-American Exposition. Superintendent of City Delivery Steward has direct charge of the installation. This device was the center of a major fraud involving J. W. Erwin with conspiring to defraud the United States Government by inducing it to make an exclusive contract with the Postal Device and Improvement Company for the purchase at an exhorbitant price of time indicators for street letter boxes. Two US Government officials were given shares of the company which was considered a bribe in court. The Montague Indicator is a device intended to be attached to street letter boxes, showing the hours of collection. On August 11, 1899, a company known as The Montague Indicator and Letter Box Company was organized at San Francisco, with W. W. Montague, D. S. Richardson, and E. M. Hoagland as incorporators. Montague is the postmaster at San Francisco, Cal., and Richardson is a cashier in that office. the device to departmental officers. Richardson was at that time superintendent of stations of the San Francisco post-office. He was first appointed to the service in 1879 as a clerk, and has been employed continuously in various positions in that office since that time. Erwin was a post-office inspector, having been appointed to that position in 1887, from Atlanta, Ga., by William F. Vilas, Postmaster-General. While appointed from Atlanta, he had lived there but two years, having formerlv been emploved in the newspaper business at Toledo, Ohio. The committee, as directed by the board of directors, visited Washington in November, 1899, and conferred with First Assistant Postmaster-General Heath and Superintendent Machen in regard to the adoption of their device. Erwin was acquainted with Heath and Machen, but Richardson did not know anybody in the Department except George W. Beavers, Superintendent of the Salary and Allowance Division. The prospect at first was not very promising, and Richardson consulted Beavers as to the best methods he should pursue to insure success. Beavers told him (Exhibit L-60) that he ought to distribute stock among the officials who were to pass upon the merits of the device. The suggestion seems to have startled Richardson at first, but, coming from a man of Beavers’s standing in the service, he concluded to follow it. He therefore tendered 1,000 shares of stock to Machen, who accepted it without hesitation, requesting that it be issued in the name of H. G. Seger. Beavers himself was presented with 2,000 shares, 1,000 shares for himself and 1,000 reported to have been for First Assistant Postmaster-General Heath, this 2,000 shares being issued in the name of Richardson. WASHINGTON. June 22-Somethlng of a surprise was created today in connection with the Post Office investIgation by the announcement that developments had been made which may bring ex-Representatlvo Loud of California, ex-Chairman or the House Committee on Post Offices, within the scope of the investigatIon. It appears that the Postal Device and Improvement Company, a California concern, composed, it is said, of postal employes at San Francisco, secured contracts for their device to register the hours when mail has been collected and will be collected on each mall box. Department shortly after the adjournment of Congress In June. 1902. The profit to the company on the device is said to be 100 per cent. Mr. Loud Is saId to have written several letters urging the device upon the department. 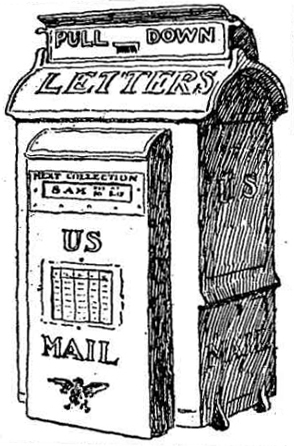 The device Is the invention of the Postmaster at San Francisco, and is known as the Montague devIce. After the first order was given considerable difficulty ensued in collecting the money. The second order was given some months ago. and has not been entirely filled yet. Representative Loud has been at the Post Office Department in behalf of the San Francisco company. It is said. but specifically explained that he was not interested In the company. He took the ground that whateYer the necessity.or lack of necessity for the device, constituents of his had secured the contract and furnished the articles called tor. Therefore. he believed. they should be paid according to the stipulation. The second contract tor 10.000 was signed by AssIstant Postmaster Wynne. it is said. It is asserted that the records of the department will show that of the $105.000 deficiency In the Free Delivery Service. with which Mr. Machen Is charged, $45.000 Is represented by 10,000 of these devices. This is denied. however, at the department. The department also recentlv adopted an improved device to be attached to the letter boxes, which automatically shows that the box has been collected from by the carrier. and the hour at whIch the next colleetion will be made from each box. These devices are now being attached to boxes In the larger cities. principally Philadelphia. Chicago, and San Franciseo. The device is a California invention. This time indicator fills a long-left want on the part of the public, as a great deal of complaint has heretofore been made on account of the publlc not beIng able to tell trom the tlme card on the face ot the street. boxes whether or not the collector had made his collections.